Shade Details: 13" x 18" x 12.25"
The Evoke Large Table Lamp highlights the classic beauty of natural stone with its monumental geometric base and clean, modern detailing. 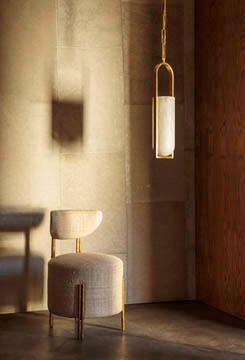 This lamp features a honed Alabaster base, Antique Brass detailing and a white linen shade. NOTES: Due to the unique, natural characteristics of our alabaster, use LED bulbs only for all Alabaster fixtures.